Wild Women of the Universe! : Boys Wearing Bracelets? 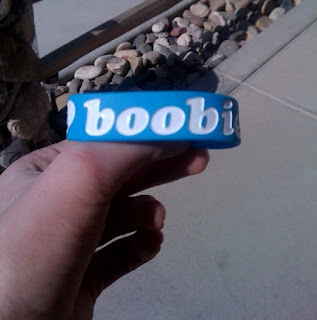 The other night, one of my thirteen year old boys, Ryan, came home with a new bracelet. Why would a boy be wearing a bracelet? You can't see the entire bracelet in the photo, but perhaps you've seen this bracelet dedicated to raising awareness to Breast Cancer Awareness. I laughed and asked him, "Ryan, when did you become so philanthropic?" I love raising these boys! It keeps me guessing...and laughing (most of the time)! I suppose he'll start wearing pink, too? That is funny! Maybe he needs a "Save the Ta-Tas" shirt to go with that bracelet? How funny.. my 12 yr old keeps me guessing too! "..you define everything to death..
You can't look at kids the way you look at grown-ups. Adults like to say kids only see them as a "finished product" but that's because Adults see Each other and Themselves as Defined. Kids have character, likes, dislikes and growth because we face constant and a lot more internal challenges than material or societal. So we keep it simple. One, we can get away with wearing something that says "boobies"; two, we can be anti-cancer, doesn't matter what kind if it's not gross; three, jewelry is pretty normal if we decide to wear some, unless we're doing it to be a poseur. Have fun being moms n.n! Perfect Moment Monday -- Skiing With My Sweetie!